Asks us to thank retirees, already working with AFT in swing states. Says no matter what happens our focuses in Albany will be funding, particularly CFE, and that city spends it well. We don’t want APs, consultants or crazies. We want reduction of class size. Other focus will depend on evaluation agreements. We are required to have one by December 31st of this year. We are in negotiations but don’t have agreement. We must have authentic student learning measures that are not standardized tests to reach agreement. We are trying to find a substitute for tests, and offer them multiple options. We would like, then, to encourage legislative support. Standardized testing should be for info, not penalization, not high stakes. Family leave agreement being discussed. ATR agreement lapsed, we are now at lowest point. Asks CLs to welcome them, respect and support them. Every school should be well managed and respectful, says Mulgrew. DOE will claim they already are. This is our time to set a tone. We will prove those that are and are not. Mulgrew consulted yesterday with chancellor, who thinks most schools are well managed and respectful. Says last chancellor did not deem that important. Class sizes reported this Friday and next Thursday, Mulgrew asks us to monitor and report. Mulgrew says we need to ask for Galaxy budget now, in case principal says we have no money. Principals required to share with us. Mulgrew says we need to have master schedules for our buildings. We need them in order to do reorganization grievances. Mulgrew says post 911 we are not allowed to have safety plans, but are entitled to see them. Does not have to be CL on safety committee. There has to be a protocol for people entering the building. UFT ought not to be escorted wherever they go. Mulgrew asks if we have consultation committees. PD committees. Safety committees. MOSL committees—form and discuss, but not yet time to decide. Will use last year’s list if there is not an agreement. School leadership teams—Did they discuss school budget? Job of teaching difficult, teachers under constant stress, we have to make sure teachers get the supports they need. We must act professional, but so should admin. They ought not to be withholding budgets or denying consultation. If principals deny consultation, there is a problem and schools are not well-managed. Such principals ought not to be in charge of building unless CLs modify their behavior. No. one issue for members, from poll, is paperwork. Was problem years ago, is new provision in contract, yet two years later it remains number one issue. There is a disconnect because things members are doing are things they are not supposed to do, as per contract. Much paperwork is tied to curriculum. Who thinks they get curriculum? Much laughter ensues. Should be list of topics, with scope and sequence, with what students are expected to know, for semester or year. Why are teachers writing this? Why would a principal ask you to write something she is supposed to supply. We get paperwork complaints in June because of bad rating fears. Important to file such complaints more early. We have to change that culture. Mulgrew’s issue is we have to figure who has a curriculum, who doesn’t, and how we systematically collect it. DOE has a lot of curriculum offered to principals online. Why would they ask us to do it? Mulgrew wants to go after paperwork and curriculum issue. They should supply in five core areas, FL being fifth. Mulgrew asks who has been given curriculum. Few to no hands. Mulgrew frustrated because principals have access to all. UFT has a chapter advocate department, first and foremost devoted to simplifying paperwork. Says it doesn’t matter whether or not you get along with principal. Says without curriculum teachers lack basic tools to do jobs, placing undue burden. Says teachers can modify curriculum. Mulgrew wants a place for us to file if there are paperwork issues. No teacher should be designing scope and sequence or curriculum maps. Says maps change from school to school depending who principal is—should be group of teachers getting together to coordinate instruction. Impossible if there is not actually a curriculum. Things that don’t get resolved will go to a citywide paperwork committee. Were only four complaints in city that made it there, despite it being number one issue with members. Mulgrew shows us paperwork reduction reporting form, encourages us to use it. Says all cases will be tracked and there will be automatic central reporting. Resolution sought could be knock it off, cut the crap, whatever. Mulgrew says we need reports. We cannot fix this if we don’t know about it. He says again this is the number one issue. Says we can file for departments who haven’t gotten curriculums, and that teachers ought not to be doing this work. We can get curriculum and modify it to meet the needs in our schools. Says it should be our number one hot button issue. Says schools may not deviate from contractual unit plans. If admin demands one daily, they haven’t got a curriculum. Mulgrew says he will focus on members not wasting time on paperwork because principals can’t manage their jobs. Non-core subject teachers ought not be writing curriculum or scope and sequence without proper compensation. Mulgrew tells us to greet new teachers and help them get bathroom keys. Says he tells them it’s a really hard profession. Just because children know you are here to help them doesn’t mean they are going to listen. Asks if people got calendars. Asks why they are so popular now that everyone has a phone. 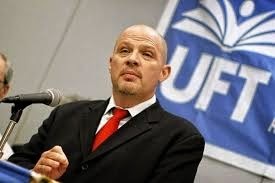 Mulgrew says state wanted to discontinue them but said UFT would rally in Albany for them. Says we send them to retirees overseas. Says a lot of CLs not getting packages, but they are right outside. Some confusion as to where they are. Says they are in deserted cafe, and that many were sent back last year. Says chapter advocates has expanded. Says they are not there forever and have to move on to other schools. New position for paras—lead teacher assistant. Are filling positions now. New posting for IEP teacher. Negotiated by VP Alvarez. Says this position is about supporting the work of instruction in special education. Who has been informed by principal that position is funded? Very few hands. 960 schools have been sent funding and have budget line for this position. This is one reason we need a snapshot of budget. We don’t want another AP telling teachers to do paperwork. Mulgrew says he’s ending his report. Says June’s around the corner. Says we have only one snow day in calendar. Says we will have to add days if we lose more than one snow day. Says we will not extend end of year, but will agree ahead of time with DOE. Says NYC has more holidays than any other system,but this gives us longest year as well. Says his email lights up whenever it snows, but decision is mayor’s. Says tone is better than with Bloomberg, wants well managed schools, respected members. Skedula—has problems with idea that everyone can look into this system. Sees it as micromanaging tool. What is union’s position? Mulgrew—Skedula designed by teachers in Brooklyn in response to Aris. Ten years later, being used all over the place. Anything being used punitively needs to be reported to union. Work product is owned by employers. Says some schools use it really well, but with a bad person, issue isn’t the tool, but the person. Says if someone’s misusing Skedula, you probably have paperwork problems too. Can student removal process be part of school safety plan? Mulgrew—Under current conditions, we believe first graders should be suspended. If there were a place to remove them and put them in clinical evaluation, we would prefer it. Only way to get evaluation has been to suspend them. We haven’t got a system set to take care of children’s needs without it. There are programs to help these kids, but they aren’t universal. We have other kids who need attention, who can’t learn with huge distractions. City may be more flexible about removals. State law does not allow them to ban suspensions. There is a SAVE legislation that says they can’t, that students removed three times to SAVE rooms must be suspended. City may want to remove our ability to remove kids. Mulgrew says he went to press over that. Says politics should not trump student learning. Says we want clinical psychologist in every single building. Guidance counselors and crisis intervention specialists ought to be available. Says nothing yet in writing, but mayor says that classrooms have to be for learning. He says city is hearing us. Says this is an opportunity to get systems in place to support us and help children who need it. Music teacher says principal has asked them to write curriculum, scope and sequence, says what is given is just blueprint. Mulgrew—principals need to give a curriculum. Cannot ask teachers to write it. Is there anything more specific about new evaluation? Mulgrew—No. If I say anything it’ll be on a blog in 15 minutes and I’ll be answering questions from NY Post on way home. Says he won’t do anything without authentic learning measures. Mulgrew announces raffle, wishes us great school year.